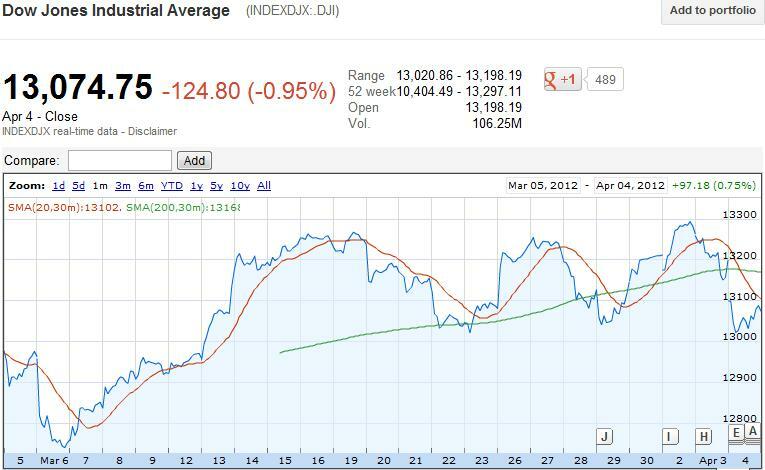 Crazy Stupid Insane Stock Market: Individual investor should avoid this market. Today was just the second triple digit drop Dow in last 3 month of which half of the loses was once again recovered between 1.30 pm to 2.30 pm when the real manipulation begins. Once again Spain issue is highlighted in the idiot box as if its new problem and it's the reason for sell off. Euro zone crisis was never over, it has only increased with time. 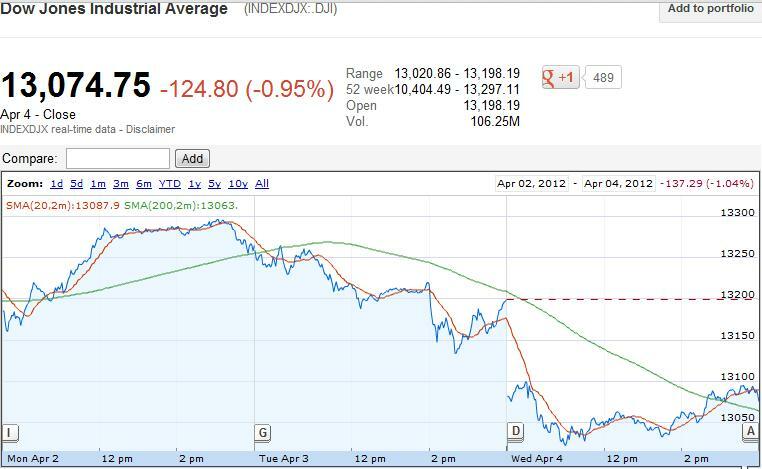 Last year it was crazy when everyday there was 300-400 point drop because of fear of Euro Zone crisis. But this year, Greece defaulted but it didn't bring a single point drop, Spain has long way to go to default but it still lead to sell off. The crazy thing about this market is ECB injected 1 trillion Euro with their 2 LTRO operation and the all the money is evaporated. Spanish and Italian government yield is back to level where it was before LTRO. An individual investor will go crazy as they don't know if the a good data is considered bad data, or if the bad data is considered good data for future stimulus. It doesn't matter which side individual investor take they will only lose money. This stock market is like a black hole which will eat away money. Avoid this market if possible save your hard earned money. The technical level to watch out for April 5th is as follow: The chart is now little bullish for the first half of the morning, but it also depends if jobless claim falls below 360k and how futures market is trading. 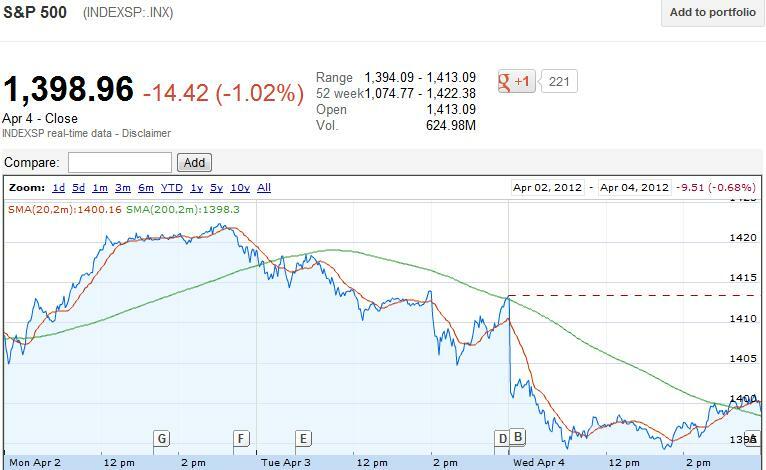 At the same time sell off is expected later of the day. For bearish sentiment to continue, Dow needs to break 13040 level followed by key resistance of 12993, S&P500 needs to break 1394 level followed by key resistance of 1388 and close below this level. For bullish sentiment to continue, Dow needs to break 13087 level followed by key resistance of 13102, S&P500 needs to break 1404 level and close above this level. For 2008 crash like scenario, Dow needs to break 12110 point, S&P500 needs to break 1269.14, ans Nasdaq needs to break 2709.28 point, which at the moment looks impossible. 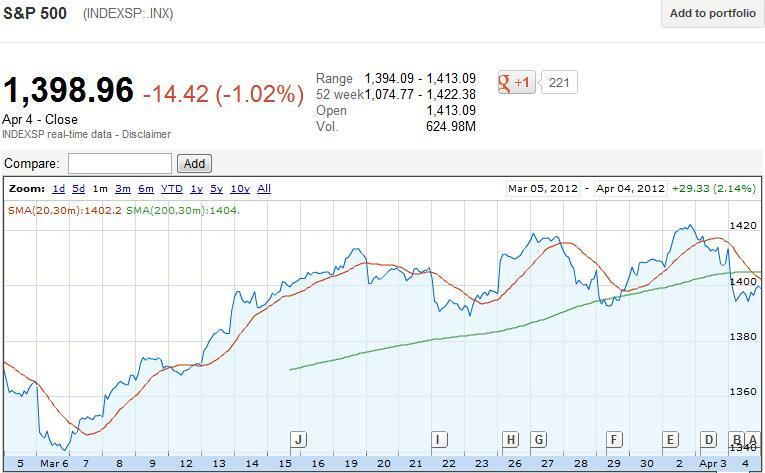 Since short term Dow & S&P500 chart is bullish but 1 month chart is bearish, Volatility can be played on daily basis. Remember Volatility is a tradable stock on daily basis but don't use it as a long term investment, it decays with time. Volatility futures is still in contango which means future prices are expensive then the spot price and so volatility will come down even if it spikes up. Stocks I am watching for tomorrow, is UVXY, FAZ, TZA, TVIX, AAPL, PCLN, CAT, MA, V.
FDA related stock to watch out for April are ALXA, FURX, CTIC VVUS, ARNA, TLON.